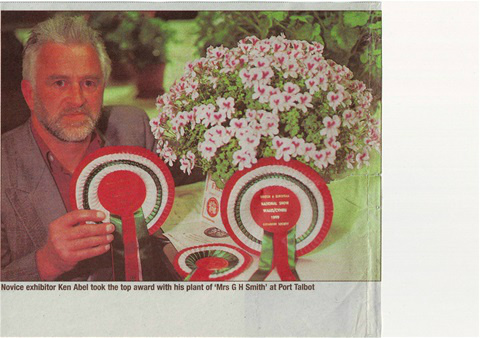 Begs National Show in Port Talbot.This is where it all started in 1999, with me winning Best in Show as a novice, plus five other trophies. A 2 year old plant of angel Catford Belle grown as standard for the show bench. These are more of a challenge to grow as a standard than zonals, but as you can see from the one in this photo that it is well worth the effort. Welcome to my website. All photos belong to me (unless credit is given to someone else) and copyright infringement is strongly prohibited. They are for viewing purposes only, not for taking without permission. If you are impressed please feel free to like the facebook page or my website. 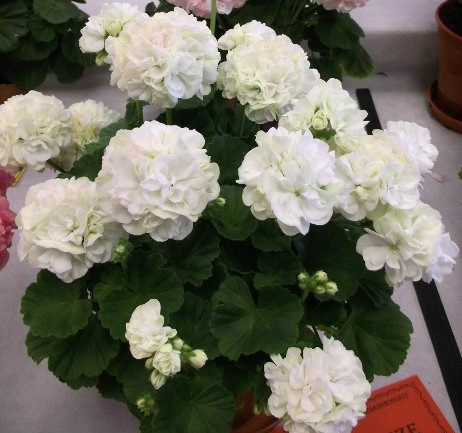 Angel seedling Carlton Carnival grown as a miniature in a 3.5" pot. 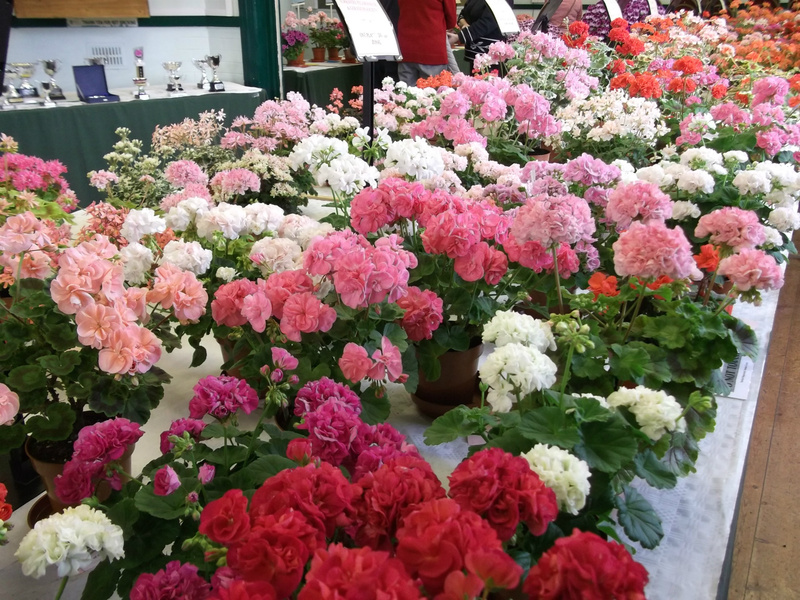 Next Talk is on February 12th 2019 at Gorleston Horticultural Society, How to grow Pelargoniums, Kevill Arms, Gorleston. 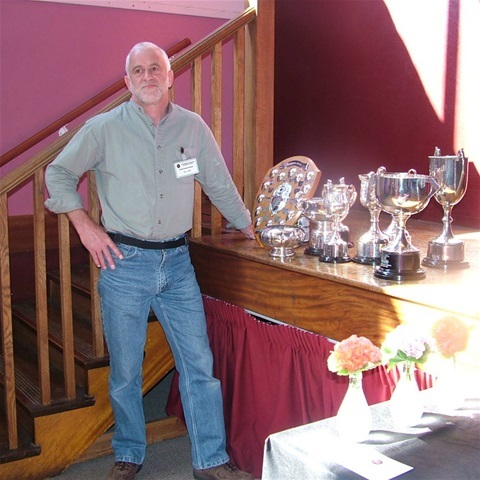 Hi, my name is Ken Abel and I live in Carlton Colville, Suffolk in the UK. I have been growing and showing Pelargoniums nationally since 1999. PLEASE NOTE I DO NOT SELL PLANTS. Most of the plants you see on this site were grown by me unless stated otherwise. If you like Hostas check out the new album with photos of plants from my collection. I hope 2018 will see us have a better growing season for our Pelargoniums and for those like me who exhibit their plants good luck on the show bench. 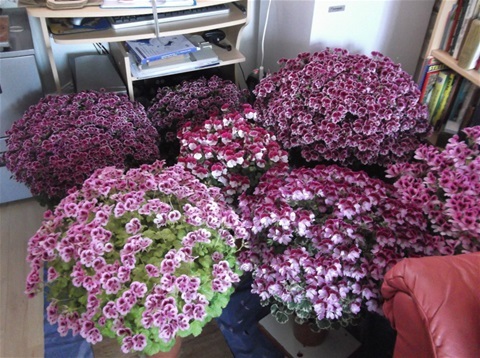 From January 2014, I started writing the monthly Pelargonium column in the "Garden News". Issue dates for 2018, 6th February, 12th March, 8th May and 31st July. 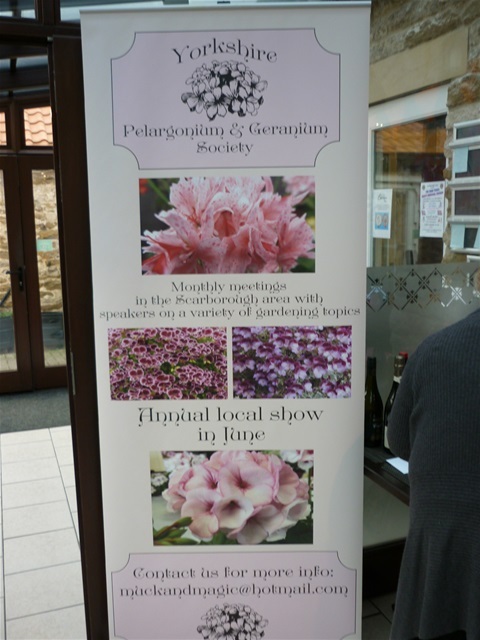 Show report and pictures are now on the Yorkshire Society pages.
" 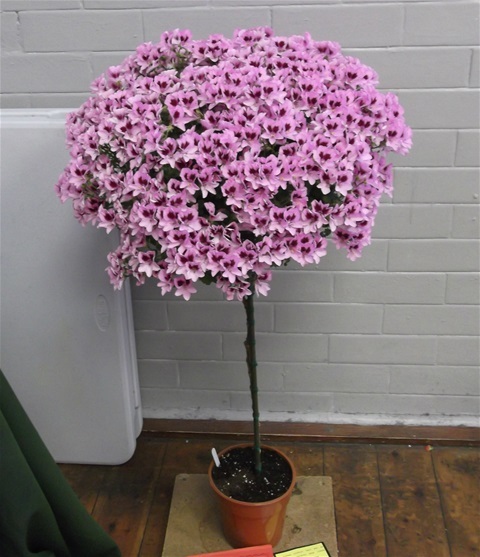 Thank you Ken for great talk you gave us in Scarborough"
Some angels standing in the coolness of our study before being loaded into the van for the show bench at the Yorkshire show 2017. Back row from left to right. Berkswell Fiesta in 6" pot, Berkswell Fiesta in 4.5" pot, Berkswell Rosetta in a 6" pot. 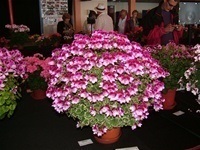 In the middle is a young plant of Carlton Tinker in a 5.5" pot. Front row Rockwell Sophie in a 6" pot, Oldbury Duet in a 6" pot and Sarah Don in a 6" pot. 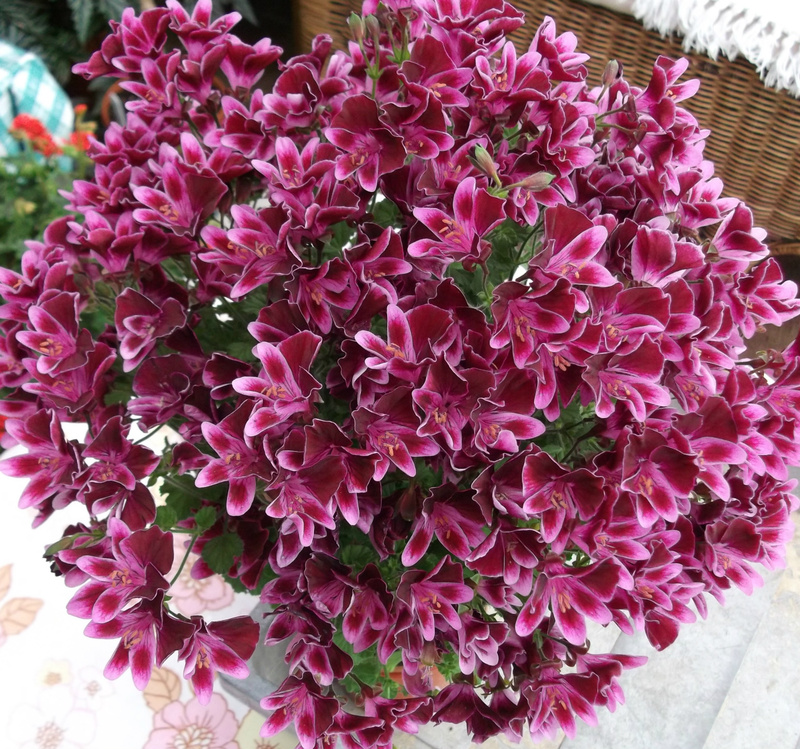 I have created this Website so you can share how I grow my prize winning Pelargoniums, see my pictures and leave a message in my guest book.Have fun. If you like a page please feel free to give it a thumbs up. Thanks for all the likes and comments left on the website over the past year. Send me the details if you have a society show you would like me to advertise for 2018. Feel free to include a picture to help highlight the show. I won 'BEST IN SHOW' With Oldbury Duet, at the BEGS National 2008. 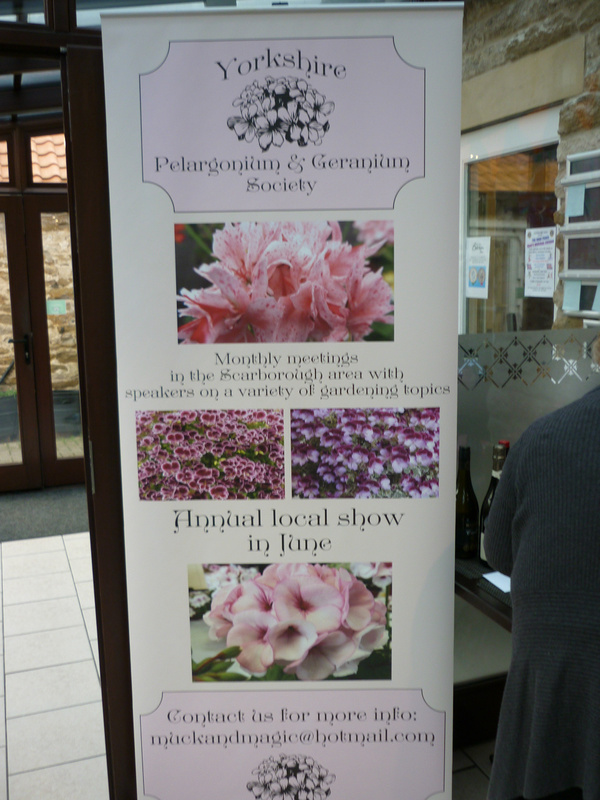 This was held in Scarborough, and hosted by the Yorkshire Pelargonium & Geranium Society. PAGS 2009 National Show report in the "Garden News".